Arrived at 3pm after repairs at Ballina, only to find that the skylight is still leaking. We are not returning to Ballina ever again, so a basin under the leak will have to suffice! To say that it is wearing thin, is to say the least. 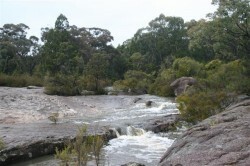 Tenterfield is a quaint little town and the surrounding National Parks are fantastic. 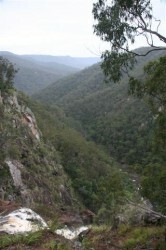 Thursday we picnicked and walked at Boonoo Boonoo NP (pronounced ‘bunna bunoo’, meaning ‘big rocks’.) 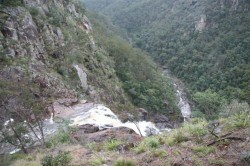 Rained all morning, but eased enough for us to enjoy a wonderful walk to the falls. 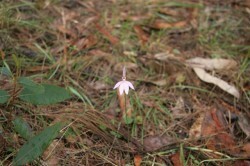 Saw some Lady Finger orchids on the way. We are very lucky to see this amount of water surging over the rocks and descending 210 metres into the gorge below – it was thrilling. Yesterday, in heavy rain, we headed to Girraween National Park. 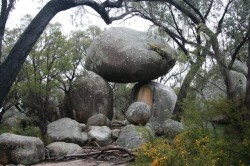 The bush here is like a landscaped garden, with huge granite boulders and rocks. All the wildflowers put on a magnificent display. There are 750 plant types and over 140 bird species. We walked to Granite Arch, crossing raging creeks, on well constructed paths. They have done a great job with well signposted walks and a large picnic area, which was surrounded by multi-trunked eucalypts and a lot of wattles (all in flower). The creek only flows on average of 2 weeks a year, so we were incredibly lucky to witness this amount of water. Time is a traveller…you are very near to our old stomping ground, Stanthorpe, and we have had many a lovely walk in Girraween & Boonoo Boonoo NP. Isn’t the granite fantastic and the wildflowers are great too. Bloody van, trade it in on a Jayco! !